The small box looked familiar. I came across it recently as I was emptying my mother’s apartment following her transition into nursing care at the retirement community, where she has lived for many years now. It was tucked in among her “Christmas-things storage box”, and was marked by its plainness. 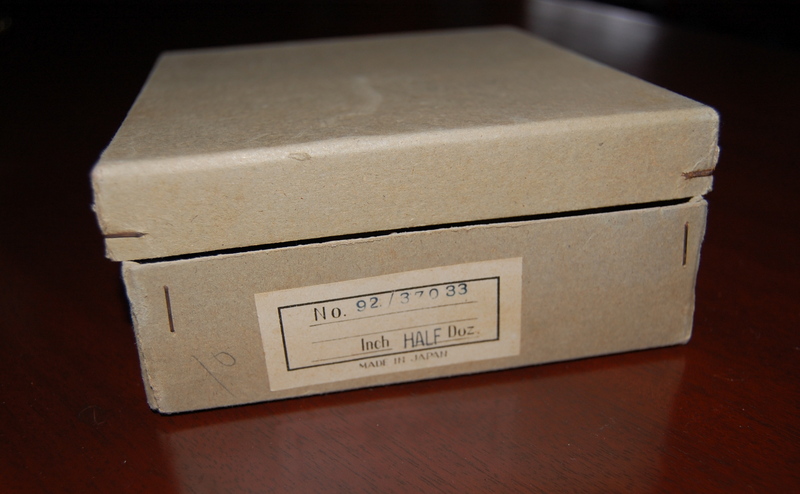 This small label is the only identifying aspect on the box. But when I opened it, I saw myself as a very young child – no more than 4 or 5 – standing in a Woolworth’s Five and Dime store, captivated by the tiny figures, six of them, arranged in their segmented box. 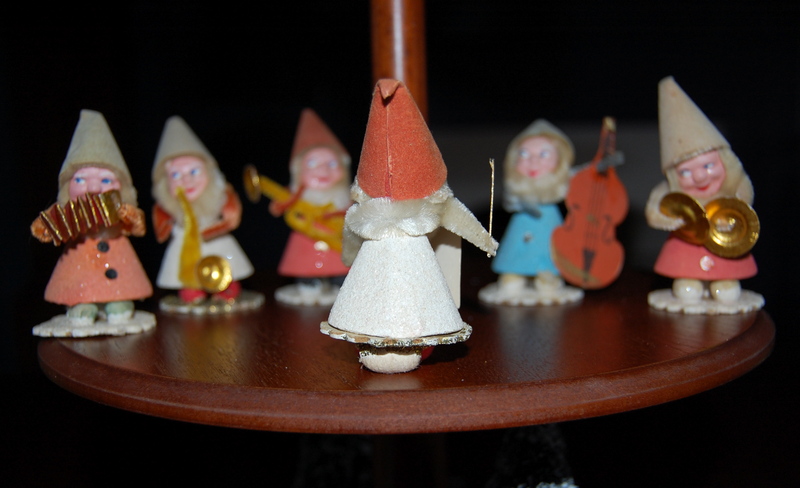 Six little musician figures, made out of cardboard, pipe cleaners, spun cotton, and paper mache. From that Christmas in 1954 or ’55 on, they were always part of our magical Decembers. 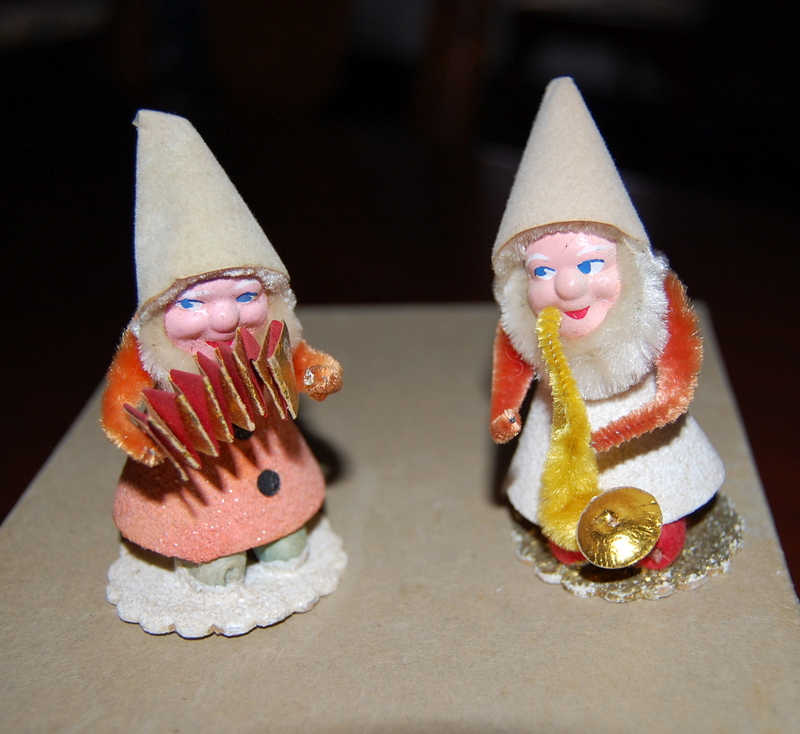 I used to look forward to having them reappear each holiday season, with their whimsical faces, their sparkly coats and golden instruments. They were a child’s joy. But then, in my early twenties, life took me elsewhere, to another state and another part of the country. I no longer went “home” for Christmas, because home had become my own house and my own family. And so it was, that for over 40 years, I had not seen these little men, these tiny musicians with their constant smiles and happy demeanors. In fact, now I realize, with the passage of so many years, I had forgotten about them, never realizing that they had continued to be part of my mother’s holiday every year. But then – I found them, not much worse for the wear of so many years. Their little cone-shaped hats now all had a wrinkle at the top, the top of the bass violin was missing, and one head was a little askew. But to me they looked perfect. The little guy in blue doesn’t look too worried about his broken instrument! The accordion player looks a little mischievous! 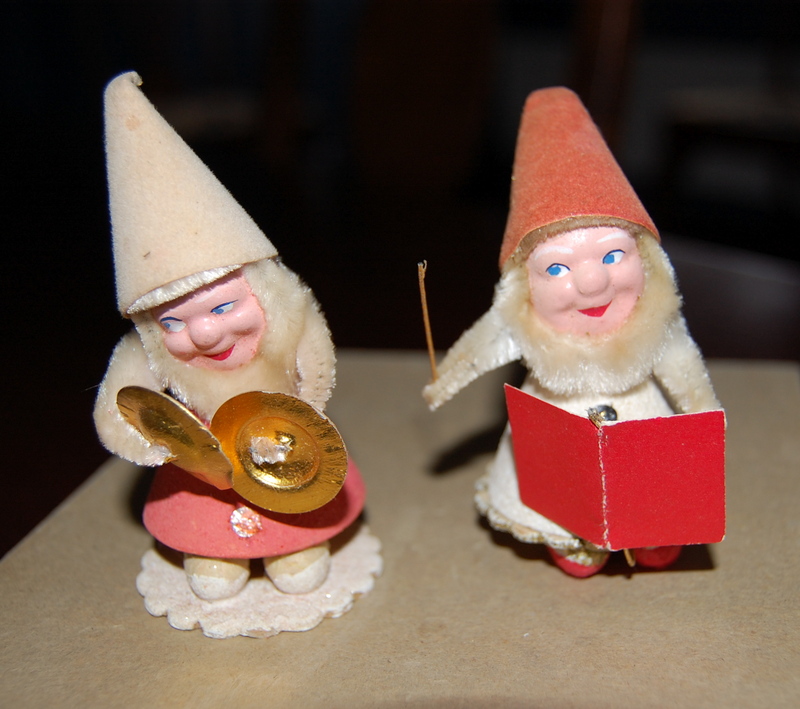 The confident conductor is on the right, while the little guy with the cymbals looks a bit shy. 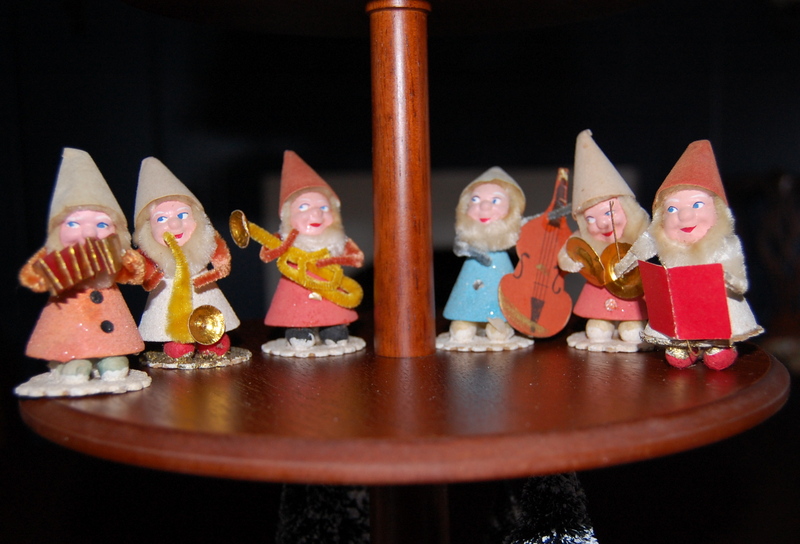 This little band of elfish musicians now have a new home here in Pennsylvania. I am struck by the knowledge that they share a decade provenance with so many of my vintage patterns; they are contemporaries, frozen in time but completely at home in this decade 60 years later. I like to think these petite musicians are happy with the thought that there are now new children to delight within our growing family. They certainly look happy! I suspect they are playing a traditional Christmas Carol with great gusto and with sound loud enough never to be forgotten again. And now, with two weeks to go in December, it is time to bid adieu to 2014. I wish you, all my readers, a most blessed Christmas and holiday season. 2015 will find us in a new sewing year, full of promise and excitement. I do hope you will join me in early January. . . It is so amazing! These all memories! Have a wonderful Christmas and even more awasom 2015! What a treasure! Every year when I pull out the Christmas things, I am flooded with memories. Sure, like your precious musicians, things are looking a little worn, but the memories are irreplaceable and now you have that precious little granddaughter to share them with! Merry Christmas! Thank you for also jarring my memories! The best of holidays to you and your family! And I am eagerly awaiting your first 2015 post. All the very best wishes for Christmas to you and yours. Enjoy those musicians! Nice thoughts Karen. 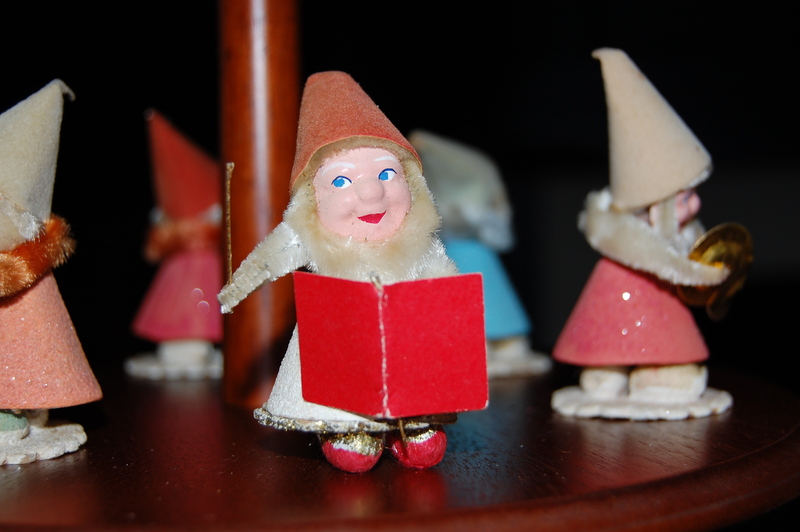 I’m fortunate to have some of the old ornaments that I remember as a child and they bring back fond memories. Unfortunately we have a tendency to keep everything so one of these days I’m going to have to get real and part with some of it. As soon as Christmas is over we’ll be heading to FL so the packing will be done in a very short time. I hope to see you again in May but in the meantime have a lovely Christmas/New Year and a good sewing 2015. Merry Christmas and a Happy New Year. Thank you for all your wonderful posts. Merry Christmas to you. Your email arriving in my mail box is like a little gift each time, something to open up and enjoy so YOUgive a little Christmas all year – probably to many people like me. So – Thank You and Happy New Year I am looking forward to many more gifts in 2015, may sewing continue to fill us all with joy. That is a lovely story! Merry Christmas to you! I enjoyed this post quite a bit. 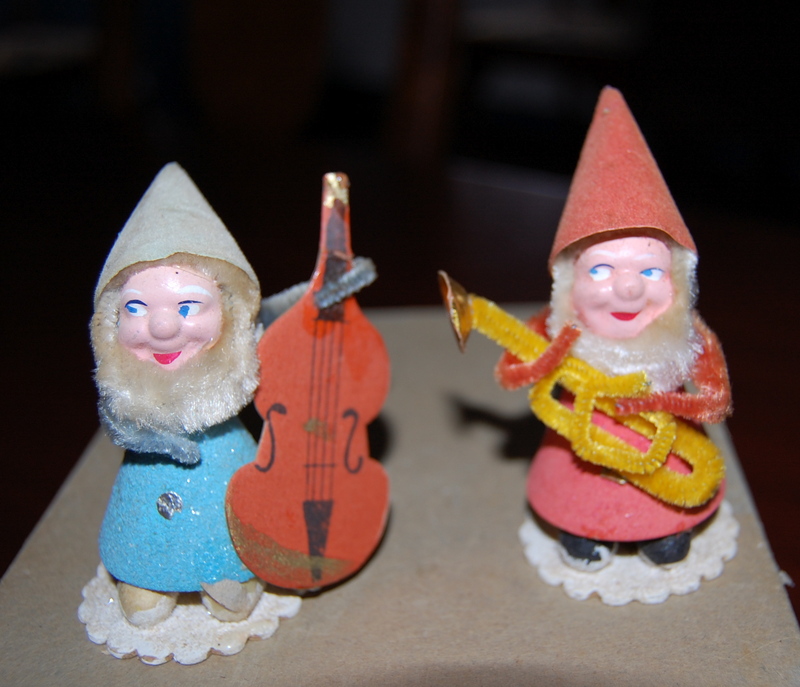 Being a 1950 baby myself makes items like these cute musicians bring forth lots of nostalgic feelings for me. It’s always exciting finding those touchstones to our past, whether it be Christmas decorations like these or a special pattern we made in our high school days. Have a great Christmas and I will look forward to your wonderful posts in 2015! Loved reading about your little musicians! Have a very Merry Christmas and I will look forward to reading about your sewing adventures next year.